Rian BE2482 of Krubah Seewichai is a metal amulet, oval in shape and about 1.2 inches in length. A half-sized portrait of Krubah Seewichai, hands holding a meditation beads. On the right hand side of the amulet, it is written the word Krubah Jow Seewichai, and the left side is written in Lanna Language is Krubah Jow Seewichai similar to the right side. At the bottom of the amulet is written the year chanted BE2482. 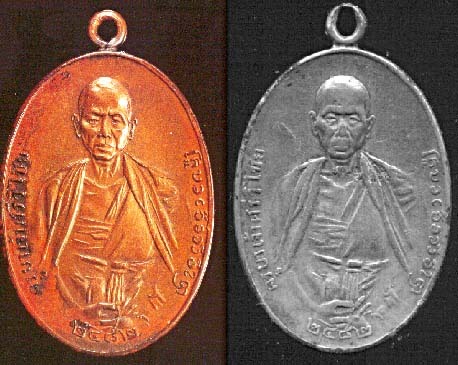 This picture from the amulet was a photograph taken in real life at Phayao Province in Wat Pratatjomtorng during BE2463 when Krubah Jow Seewichai was 56 years old. 4. Neua Torng Pah Baht (alms bowl's material). The amulets was mass-chanted together with Rian Somdej Pra Sangkaraht Jow on 16 December BE2481 at Wat Raht Borpit. It was chanted again at Wat Pratah Hirigunchaai, Lampoon Province. This amulet is very well proven too and many people have many good experiences to share after wearing this amulet; protect one from accident and danger. Good for every purposes, such as metta mahaniyom, kong grapan and kleow klaht. There is a believe that, if you have a Krubah Seewichai amulet, whatever you wish for sincerely, will be fulfilled because Pra Krubah Seewichai was a monk who has aquired alot of merits. And one who has this rian BE2482, it said to have aquired enough merit as well, because it is very difficult to find a genuine and good condition piece and not to mention that, the price of this batch of amulet is astonishing high. A good condition copper rian of BE2482 can costs about 2 - 300,000 bahts and a silver piece can cost between 3 - 500,000 bahts.